JNN 05 Aug 2015 Sanaa : A top Yemeni tribal source said the bodies of 103 foreign troopers have been recovered from a military airport in the Central Yemeni province of Ma’rib, where they came under a rocket attack by Yemeni army forces and allied Popular Committees. Meanwhile Brigadier General Ahmed al-Asiri, Spokesman of the Saudi-led war on Yemen, confirmed that the ten Saudi military men were killed during the attack of the Yemeni forces on an arms depot in al-Safer region in the Eastern parts of Yemen. In a separate Official Statement The UAE army declared that it has lost sum of 22 army men in the attack . He further noted that at least 70 people, mostly Emirati soldiers, also sustained injures in the Friday afternoon’s incident, and some of them are in critical condition, press tv reported. In a separate attack, at least 16 Saudi soldiers were killed in an ambush by Yemeni popular forces near the Mash’al base in the province of Jizan in Southern Saudi Arabia. In the third attack, 5 Bahraini soldiers were killed in Ma’arib in province, Arab media outlets reported. Meanwhile on Saturday morning, Saudi fighter jets pounded a residential neighborhood in al-Sabain district of Sana’a province, leaving five Yemeni civilians dead. At the same time, Yemeni forces have smashed an al-Qaeda-affiliated terrorist network that planned to assassinate a number of political, security and military figures, and also target vital installations and infrastructure in a bid to further destabilize the crisis-hit Arab country. 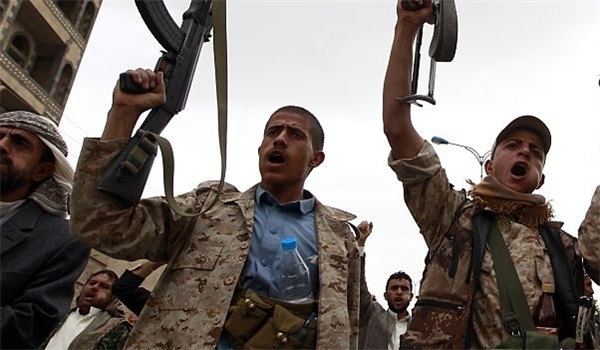 Informed sources, requesting not to be named, said Yemeni soldiers recovered more than 300 grenades, sixty rockets, a considerable amount of ammunition for light and heavy weapons, binoculars, mortar shells and artillery rounds from the detained Takfiri terrorists. Yemeni soldiers backed by Popular Committees fighters wrested control of the strategic Jebel al-Wa’ash mountain overlooking the Southwestern Yemeni city of Taiz, situated 346 kilometers (214 miles) South of the capital, Sana’a, on Friday, killing and injuring an unspecified number of Saudi soldiers in the process. Yemeni soldiers and allied forces also launched a barrage of rockets at Abu Saloul, Khazan and Khojrah military bases in Saudi Arabia’s Tawal region on the border with Yemen, but there were no immediate reports of casualties and the extent of damage inflicted. Additionally, Yemeni forces fired six missiles at Bin Yalin military camp in the Southwestern Saudi city of Najran in retaliation for the kingdom’s relentless airstrikes against various regions in Yemen. No reports of casualties were available. Saudi Arabia has been striking Yemen for 164 days now to restore power to fugitive president Mansour Hadi, a close ally of Riyadh. The Saudi-led aggression has so far killed at least 5,653 Yemenis, including hundreds of women and children. The Yemeni army and the popular forces have given a 72-hour deadline to the Saudi-led aggressors to retreat from the occupied areas in Yemen, a senior commander announced on Saturday. “Saudi Arabia and its allies have three days to leave Yemen, otherwise they will face large-scale military operations in the coming days,” a high-ranking Yemeni military commander told FNA today. The Yemeni commander, meantime, hailed the unique operations of the army’s missile units in al-Safer region that claimed the lives of at least 45 UAE, over 16 Saudi and 5 Bahraini soldiers. This entry was posted in Middle East and tagged Al Safer Airport, Popular Committees, Saudi Arabia, Saudi Led Aggression, Yemen, Yemeni Forces. Bookmark the permalink.